Morphe JH Palette - I am so happy I finally got this palette it was defiantly worth the wait. The colour payoff on these shadows are amazing and the colour selection to die for, I love everything about this palette. Katy Perry Killer Queen Perfume - I have been wearing this scent all month long and I am almost out! I will be picking up another one, I wont try and describe the scent to you all as I'm hopeless at that but all I can say that it has a beautiful sweet musky scent to it and you should have a sniff next time you see it. Max Factor Face Finity Primer - Love this primer I think it may have knocked my fave Revlon primer out of the way (review here) and become my favourtie drug store primer for my oily skin. I still get oily in my T Zone during the day but not as much as normal and I have noticed a huge improvement to the amount of oil I would normal get over my face so worth a purchase if you are another oily girl like me. L'Oreal Infallible Foundation - I have been using this foundation on and off throughout the month of May and I love the medium coverage it gives me and the way it settles on my skin. I have had no troubles with it and my oily skin but I do wear a primer add powder and set my makeup when I wear it to achieve the look I want and to help with the staying power. I am really looking forward to getting my hands on the matte range of this foundation when it gets released here in Australia. Gerard Cosmetics Rodeo Drive Lipstick - This lipstick has been one of my go to colours for Autumn/Winter its a gorgeous light plum colour that goes with everything and if you don't own a lipstick from Gerard the formula is so smooth and creamy and just glide on your lips. If you want to see a bit more about Gerard Cosmetics I have my first haul here. Bella Makeup Brushes* - I have a full review of these babies over here so I will not bore you all with all the details again I will just say I am so surprised with the quality of these brushes and I have been using them non stop since they arrived. YSL Touché Éclat - I finally picked up the ever so popular Touché Éclat from YSL and it is stunning from the sleek gold packaging to the actual formula. I had asked over on my Instagram (@nicolesbeautybabble) how everyone used it and took the advise from my fellow beauty lovers and I have been using it under my eyes, down my nose and chin where I want to add a bit of a highlight and it works beautifully and stays put during the day. So so happy with my purchase. L'Oreal Miss Manga Mascara - Another one I have talked about before here, I have still been loving this mascara! I love the brush and the formula, it just makes my lashes look great and not spidery at all. Max Factor Creme Puff Blush in 20 Lavish Mauve - My go to blush of the moment and such a lovely colour for Winter. It adds just the perfect pinky mauve colour to your cheeks and lasts all day. The blush is actually a powder even though the name has creme in it. 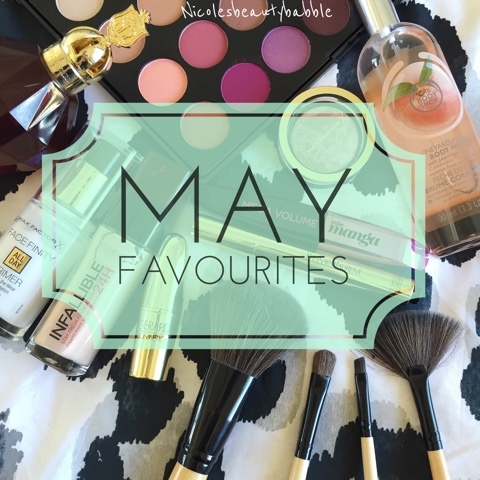 I would love to know what you were loving for the month of May so please leave me a comment below or even your link to your blog post so I can have a read. I wish I could have gotten the JH palette, it looks beautiful and the reviews are amazing!!! ​Have you ever tried Calvin Klein Obsession Summer for women? It is really a great fragrance in the summer season. I think this perfume could be a great option to use in May when the full summer is shining. By the way, thanks for sharing this post.